Sentiments/Non-Humans: She has no particular issue with human looking non-humans. She can see them as equals as long as they do their part to aid society; Monstrous or useless creatures are reprobates to be pitied, at best. Sentiments/NGR: Fanatically loyal to her home country and Triax in general. Sentiments/Coalition: As stable governing partners go, you can't do better. She has a distaste for some of their methods. Their treatment of psychics, in particular is of some concern. Sentiments/Ishpeming: The Republic of Ishpeming is alright. Certainly better than the C.S. But there's no place like home. Sentiments/Black Market: Parasites with a use, for now. Sentiments/Gargoyles and Monsters: Vile creatures to be exterminated. Disposition: Professional and focused, Mink is almost universally friendly, but can into an ice queen instantly. She isn't inherently a flirt, but she can turn on the charm like the flip of a switch, and then turn it off just as quickly. Sexuality is a last resort, not a first foray. On Morality (alignment): Mink values life and freedom, especially that of the citizens of the NGR in particular. She has taken an oath to protect them, and she takes that very seriously. She is not viscious or vindictive, but she can be brutal if the situation calls for it. She will always attempt to work with or within the law whenever possible. But part of her job is working outside the law, outside normal procedures, and still maintaining her principles and values. She will bend and, occasionally, break the law when deemed necessary. This means she may use strong-arm techniques, harass, break and enter, steal, and so on (but only against the bad guys). Betrayal, however, of any oath or promise simply not an option. Insanity: Obsession: Creating more and more realistic covers. Wants to have multiple fall backs, all with full backstops, safe houses, and allies. +10% to all skills from High I.Q. 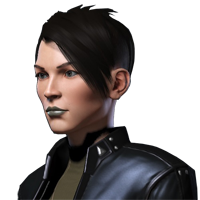 Identity 1: Corporal (retired) Sarah Paulding: Coalition States citizen, former Psi-Batallion operative, served in Tolkeen and got out afterwards. Currently employed as a mercenary and undercover informant. From Chi-Town's lower levels. Has an IC chip, but it has two layers of security. One lists her as a minor psychic with healing powers and the other, accessible only by higher level scanners (such as those held by officers) list her true abilities and psi-bat training. Identity 2: Alicia "Mink" Minkowski: Ishpeming citizen, former police officer (infiltration). Currently doing freelance work in Merctown. Occasionally passes back sensitive information to Ishpeming and Northern Gun. Robert Dugan (Manager of the Escanaba NG Bounty Registry Office; Was introduced by Easterbrook as her cover identity. She is registered with the office for bounty work. Casual Acquaintance). Feitz Harbicht: Editor of the Warhawk (tipped by Robert Dugan she is a good candidate for a war correspondent. Casual Acquaintance). Jimmy-U, Naruni Owner and Manager of Palace Hotel and Resort (Aware of her NG record and how she is much better than some rank rookie. Casual Acquaintance). L1: Psychic Agent: Character is major psionic. L4: Supernatural Expert: Agents that show exceptional aptitude in a particular area of study are encouraged to pursue further study. The agent receives a +5 bonus to Perception Rolls regarding Demons & Monster Lore, Magical Lore (such as rituals, specific abilities of magic users, or information), or Psychic Lore and is particularly knowledgeable about such subjects. Body Flip/Throw: 1d6+3 and victim loses initiative and one melee attack. Roll with Impact will reduce damage by half, but counts as one action for the victim. Body Block/Tackle: 1d4+3 damage and 1-50% chance of victim losing initiative and one melee attack. victim loses initiative, is knocked back 1d6 feet and one melee attack. Roll with Impact will reduce damage by half, but counts as one action for the victim. Backward Sweep: Pure Knockdown attack to opponent to character's rear. No Damage. Cannot be parried and target's dodge is at -2. Victim loses initiative and one melee attack. Full Speed Running Ram: Double Robot (or Augmented) P.S. punch damage, plus 01-50% likelihood of knocking an opponent off his feet if the opponent is the same size or smaller (reduce by half if twice as big). Victim takes damage and is knocked off his feet, losing initiative and two melee attacks/actions. Class: Light Strategic Espionage Power Armor with UEL system. * A single asterisk indicates a small or difficult target to hit. They can only be struck when the attacker makes a “Called Shot,” and even then the attacker is -4 to strike. Destroying the head/helmet eliminates all forms of optical and sensory enhancement, leaving the pilot to rely on his own human senses without any of the bonuses granted to him by the Robot Combat skill. Running: 50 mph running at top speed; can go from zero to 50 in 24 seconds. The act of running at top speed tires out the operator, but at 10% of the usual fatigue rate thanks to the augmentation of the robot exoskeleton. Leaping: A leap can reach 12 feet (3.7 m) straight up or across. 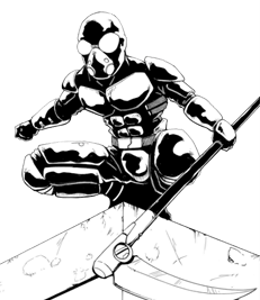 Climbing: +5% to the Climbing and Spelunking skills, and +3% to the Acrobatics and Gymnastics skills due to the enhanced exoskeleton. Flying: None, except with a jet pack on the back (costs extra) or a glider like the one used by the Silent Shadow (costs extra). Water: The Night Reaper is not designed for use in the water, but can swim in water at 10 mph (16 km) or walk along the bottom at 5 mph (8 km or 4.3 knots). Maximum depth is 400 feet (122 m). The act of swimming tires the wearer of the suit, but at 20% of the usual fatigue rate. Special Bonuses of the Power Armor: +1 to dodge at any speed, +2 to dodge when traveling at speeds greater than 90 mph (144 km) and +1 to roll with impact. Width: 2-3 feet (0.6 to 0.9 m). Weight: 324 lbs (56 kg) plus any other gear. Power System: Nuclear; average energy life is 15 years. 1. Handheld Weapons (and UEL) Only: This light stealth armor has no built-in weapon systems, but uses any number of handheld weapons. Energy weapons are the usual choice because they can be powered by the UEL system. An additional side arm, Vibro-Blade and other gear may be carried on a belt around the waist, slung over the shoulder or in a backpack. UEL – Universal Energy Link (2, one in each forearm): The Universal Energy Link is concealed under a layer of forearm plating. When needed, the plate opens and extends enough for the E-Clip connector of the UEL and cable to be removed and plugged into the weapon. The plate armor snaps back into place and a thin cable runs from the back of the forearm, near the wrist, from under the armor and to the weapon in hand. One concealed UEL is built into each forearm. Each can provide power to a weapon that fires as much as 1D6x10 M.D. per blast, but anything more powerful saps the system and causes it to shut down until replaced with a more appropriate weapon (i.e. something that fires blasts that inflict less than 1D6x10 M.D.). The E-Clip connector has an automatic circuit breaker that kicks in when the pilot is attempting to use a weapon beyond the UEL’s energy capacity, shutting it down before an excessive energy drain damages the armor. Note: An extra or emergency UEL can be built into the thigh of one leg, but costs an additional 160,000 credits. Primary Purpose: Assault and Close Combat. Rate of Fire: Single Shots; Equal to the number of combined hand to hand attacks of the pilot and his power armor skill. 3. Vibro-Scythe (Handheld Weapon): The Vibro-Scythe is a new weapon that Northern Gun is testing by making it currently available only with the purchase of the Night Reaper power armor. If there is a demand, NG will add the weapon to its line of Vibro-Blades. A scythe falls into the pole arm category of weapons. Silver plated for fighting the supernatural. Range: Melee combat. The Vibro-Scythe can strike up to 4 feet (1.2 m) beyond arm’s reach. Overall length is 7 feet (2.1 m). It is most effective as a two-handed weapon. Mega-Damage: 3D6 M.D. ; takes into consideration the power armor’s Robot P.S. The weapon itself ordinarily inflicts 2D6 M.D. Rate of Fire: Equal to the number of combined hand to hand attacks of the pilot and his power armor skill. Payload: Unlimited when plugged into UEL, otherwise one hour per standard E-Clip. 4. Hand to Hand Combat: See Basic or Elite Ground Power Armor Training, depending on the pilot’s level of skill. Damage as per Robotic P.S. of 22. Power Punch: 2D4 M.D., but counts as two melee attacks. 5. Sensors and Special Features of Note: All standard features for power armor plus the following. Maximum Speed: 80 mph (128 km). Maximum Range: (Electric) 600 miles (960 km). Although any version of the pack may overheat if used continuously for more than four hours (01-40%). Overheating will burn out the internal systems, destroying the machine. The jet pack should be allowed to cool for two hours after every two or three hours of continuous use. Maximum Altitude: 900 feet (274 m). Size: 2.4 feet (0.73 m), 40 lbs (18 kg). M.D.C. Main Body of Jet Pack: 35. Controls: The control unit is linked to the communication system of the body/power armor and responds to verbal commands or spoken codes. It has been programmed to respond to codes typed in on a miniwrist computer (such as the suit or body armor). Winterization: The winterization package (applied to PA and jet pack) reduces all penalties for operating in snow and ice by 50%. Strangle Cord: A garrote wire is concealed at the wrist of the left arm. It is an assassin’s tool used for strangling people, but in a pinch it can also be used for climbing. Concealed Compartment: There is one concealed compartment in the top plate of the left arm. It is just large enough to carry a small lock picking tool kit, 2-4 Shurikens (Ninja throwing stars) or climbing cord. Climb Grippers: The palm of the hands, each finger and the boots of the Night Reaper armor have small, extendible and retractable spikes designed to help the wearer scale walls and climb surfaces (walls, towers, trees, cliff facings, etc.). The spikes are much too tiny and short to be used as a weapon, but they do provide an additional +3% skill bonus to the Climbing and Spelunking skills. Soft Soles and Stealth Features: The soles of this light power armor are rubber treads, providing extra grip against most surfaces (the gripper spikes, above, extend through small holes in the rubber soles). The rubber also cushions footsteps to make the footfalls much quieter and sneaking around possible without the loud, heavy clunks and clanks of most other power armor. Moreover, fabric and padding is laid over and between armor plates to soften the sounds of all movement. There is NO penalty to Acrobatics, Climbing, Gymnastics, Prowl, Swim and other skills that are usually diminished by heavy body and power armor. Multi-Optics System: The large, goggle-like eyes of the Night Reaper contain a wide range of optical enhancements: Passive nightvision (light amplification; range 1,600 feet/488 m), infrared optics (can see in total darkness and through smoke, however, an infrared light beam is emitted which can be seen by others with the ability to see the infrared; range 1,600 feet/488 m), ultraviolet vision (can see the ultraviolet light used by some security systems; 400 foot/122 m range), binocular telescopic sight (2 miles/3.2 km range), macro-magnification (x12 for close work), and a built-in digital camera that can store 100 hours of video and take 4,000 still pictures; camera has the same telescopic and macro features for distance and close images). All are perfect for spy work and surveillance. Voice Modulation: The mouthpiece of the helmet includes a built-in loudspeaker to serve as a bullhorn, language translator and voice modulator (changes/disguises the wearer’s voice; 20 different variations). Audio Amplification System: In effect, the same as the Combat Cyborg’s Amplified Hearing cybernetics to hear soft noises, like the click of a safe’s tumblers or an approaching adversary. Drone Control and Command Unit (in left arm; displays via HUD): The DCCU is, in effect, a command suite with one large, two medium and two small screens to monitor as many as five drones at a time, a virtual keypad for sending numerical and typed commands, a radio-link to transmit voice commands, and other elements related to controlling and monitoring drones. Everything the cameras of the drones see, the wearer of the DCCU can see, via live feed. Moreover, the control gauntlet can be used to record, edit and transmit video and frame images, making the gauntlet a mini-video editing system. (The TV/Video skill is necessary to do elaborate editing, splicing and filmmaking.) Video, audio and other data collected by a drone is transmitted from each drone to the gauntlet, which can, in turn, transmit the information to a portable computer, a vehicle, giant robot or any receiver capable of receiving such signals (5 mile/8 km range). While images from only five drones can be displayed at a single time, as many as 10 drones can be linked to the control gauntlet with the user having the ability to flip from one to another. This is especially handy if a drone transmits a help signal. • Thermal Reduction: The fabric and strategic padding of the Stalker Suit is specially designed to dissipate the wearer's IR heat signature, making him more difficult to detect with thermal-imagers and similar heat detection equipment. All attempts to detect the Stalker Suit with thermal systems suffer a penalty of -20% to the Read Sensory Equipment skill. This pouch holds four hand grenades packed in foam with a built in plastic cradle for ease of removal. ☞ With optional hand's free unit for when in armor only. Capacity: 1590 cubic inches (26 liters) unloaded. Mega-Damage: 4D6 to magic barriers, including force fields and armor. Against living opponents it drains its victims of P.P.E. : Mortal beings lose ID6 P.P.E. points, practitioners of magic 3D6, and the supernatural or creatures of magic 4D6 points. Payload: Stormspire clip holds 12 shots, but most other types can store up to 24. Costs 10 P.P.E, or 20 I.S.P. to load/store one "sapping" energy bolt. Speed: 10 mph (16 km) maximum. The drone can hover stationary, move at slow speeds to keep pace with investigating police, move up and down, side to side, forward and backward. Altitude: 11 feet (3.4 m) maximum. Height: 9 inches (23 cm). Width: 6 inches (15 cm). Length: 18 inches (46 cm). Weight: 7 lbs (3.2 kg). * An asterisk means a small and difficult target to hit and requires a Called Shot to strike, and even then the attacker is -5 to strike if it is hovering stationary and -8 to strike if it is moving. Bonus: +1 to dodge attacks and falling debris. Power System: Battery with 120 hours of life. Criminal I.D. Recognition System: Comes standard with the Criminal I.D. Recognition System, which is new and experimental for NG, but seems to work very well, with an 89% success ratio. The recognition system is part of the computer and linked to the cameras in the armor, gun camera and Floater Camera. This facial recognition system can identify as many as 250,000 known criminals, wanted fugitives, Black Marketeers, terrorists, enemies of the state, and people with bounties on their heads, as well as identifying marks such as tattoos, scars and other distinctive physical features, known gang insignias, emblems, patches and “colors.” If desired, it can include recognition of suspects wanted for questioning (provided his or her face is known and on record) and dangerous D-Bees, monsters and, well, anybody who has been photographed or who can be photographed and programmed into the system. It also has a small light that can be directed like a flashlight and a laser distancer to identify distance and paint locations. The range for the light is 200 feet (61 m) and 600 feet (183 m) for the laser distancer. Secure cards are coded to the user's identity...and traceable by the CS and NGMI central bank. Useless if stolen! Non-Secure cards are like the cash cards used today as gifts and usable by anyone. Readily available source of income if stolen! Ilsa Nerzol grew up in Frankfurt, and found she was psychic by age 10. Her family put her in a government run boarding school almost immediately, though they did visit her a few times a year and talked to her often. So it was that she grew into her power not regretting or hating it, but rather feeling accepted and wanted. The boarding school groomed all of its students, all psychics, into military or corporate service and it was no different for Ilsa. By age 14 she had already begun the underlying scholastic training she would later master as a intelligence agent working for the Federal Intelligence Service (BND) - Bundesnacbrichtendienst. She spent much of her early career working the back end of other agent's cases at their offices in Berlin. Two years later, she was assigned to back up on long term surveillance of a terrorist group in the Black Forest, based out of Frankfurt. Intel on the ground said they were working cross purposes to the gargoyles, but working with a group of French Blood Druids intent on opening a series of rifts inside Berlin itself so that minions of Hell itself could invade and catch the tech nation by surprise. It took a year for the team to find and eliminate the cult. The lead investigators set up a series of raids that saw the mutual destruction the task force and the cult. In the end only two people survived more or less intact. One of the cultists (a witch to God knows what) and Ilsa. She recovered the dead, policed the dead, gathered intel and waited for a pickup. Ilsa worked the remains of that case in every bit of her spare time, pouring over frame of footage, re-enhancing and re-imaging shots too degraded to be used to glean something of it. While helping to close two other cases, she managed to clean up enough of the final seconds of the battle to figure out where the cultist had gone: the St. Louis Arch. Its sight lines are unique enough so as to be immediately recognized. It helped there was a patrol of Coalition SAMAS that had been flying by as well. She was even able to get a squad name. The problem was that the CS said it had no record of the event at all. No patrols had seen the event at any time. They did approve an investigative team to be sent to follow up on it. Seeing it as a wild goose chase, her supervisors only sent one agent, but gave her enough material support to get her started. Her orders are simple. Figure out when and where this event will happen and then terminate this individual before he can cause more havoc. The BND set her up with a contact in the Coalition's Psychic forces, so she could be given a cover there, and with a contact in the NGR so she could be outfitted. After that, she is to go into the mercenary communities of North America, without blowing her cover, and find the perpetrator and use the CS to terminate him. She has been assured that once given a set of coordinates, the CS would send a specialist Search and Destroy team and capture and interrogate him and pass on any information to the NGR after they kill him. Ilsa knows that she must do all she can to get any information before the bad guy can be passed to the CS for termination. As long as she can verify that he has not been up to his old tricks here. She spent two months acclimating to Ishpeming, becoming one of the people there before contacting her people in the approved manner. In that time she became quite involved with the local parkour scene and got connected to fellow enthusiasts. Granted her skills had been learned as part of government training, but she genuinely enjoys it, and that comes through. Within a few weeks, she was outfitted, been registered as a mercenary investigator in Ishpeming, had rendezvoused with her CS contacts, been given the means to introduce herself to her second Coalition contact and otherwise been set to go. Now, at the gates to Merctown, she begins looking for her contact and then a group to join so she can blend in here as well. Iron Star - For conspicuous gallantry at skirmish in Black Forest dated 12 December 2395; Corporal Nerzol recovered the bodies of all slain soldiers and personally cleaned up the attack site after millitant escape via dimensional anomoly. Promotion Recommended based on actions and previous record. Soldier was trained in a special school for Psychics and given proper conditioning to allow for normal emotional development, along with prescribed loyalty to the NGR. Subject 83C285E02D, a male caucasian of approximately 40 years of age is shown stepping through an open rift. In the background the Arch of Saint Louis in North American is prominent (it is late afternoon there). So is a patrol of twelve SAMAS flying overhead. An original version of the picture is also included, as well as the enhanced version. Blown up imaging shows the SAMAS patrol's squad identifier on their legs. Date: 12 December 2395, Time: 2259. Attached missive from Coalition States of America: Coalition States review of specified date and information deemed inconclusive. Found no records of a Rift opening at that location or time. Attached missive from Agent Nerzol: Suggest a time dilation effect might have occurred pushing the event into the future. Suggest further investigation. Biographical Commentary: Sarah Paulding and her older sister Hannah were orphaned at an early age due to their psychic prowess. Hannah, a full fledged Dominator by age 14, and young Sarah, already an impressive psychic sensitive by age 5 were taken in by one of the Psychic Registration Program's first psychic boarding schools in the 'Burbs of Chi-Town. They were groomed to serve the Coalition from then on, and both entered service at age 18. Hannah managed to get herself accepted as a junior officer very quickly, partly due to her prowess as a Dominator, and partly due to her drive. By contrast, Sarah was a wallflower. She joined the ranger corps at an early age and was assigned to a light infantry unit during the Tolkeen War. She distinguished herself, but not to the heights her sister has. Still, the Iron Cross for bravery in combat is nothing to sneeze at. She also earned a purple heart for the wound that eventually took her out of military. She had both hear eardrums blown out by being too near a Glitterboy while it was firing. She still managed to plant the explosives that took it down, but her hearing was irreparably damaged. For her years of service she was given cybernetic replacements, but she also took a voluntary retirement while she worked through her recovery. Now she is a registered civilian courier, licensed to bear arms while outside of a city. She runs messages for various civilian companies. Iron Star - For conspicuous gallantry at skirmish in Tolkeen Containment Zone dated 12 October 109; Corporal Paulding snuck up to a glitter boy that was pounding CS emplacements in a siege. She planted a couple of fusion blocks on armor and began to retreat. Unfortunately the armor began firing again about the same time enemy supporting units found her and ripped her helmet off. Between the sonic boom of the weapon and the explosion, Corporal Paulding's hearing was lost. Purple Heart - for injuries to eardrums sustained in the line of duty. Awarded cybernetic hearing replacement. Used voluntary retirement option for recovery. Evaluation: Excellent work ethic, strong skill set, extra-martial skills a boon to work. Background Information: Born and raised in Escanaba, after a career in civilian journalism and private investigation, Private Minkowski enrolled in the ICMN School of Soldiery and was accepted to the Special Operations Center for training. Her civilian skills are complementary to her SOC skills, and she has the abilities of a much more experienced intelligence operative, but it is still in need of seasoning. Her teamwork is excellent, and she is very observant and good at thinking on her feet and keeping her cool under fire. She is a major psychic with sensitive type abilities. Special-Ops Mag-5 Jet Pack: This jet pack is equipped with a special silencing system that muffles the sound of the rocket jets. This reduces the speed of the system compared to other types and brands of jet packs, but provides the user with a reliable flight system ideal for espionage and reconnaissance. Power Supply: Four E-clips — the same types as used in CS weapons! Each E-clip provides 20 minutes of flight. The use of the E-clips is an alternative battery system that offers the special operative greater versatility; an E-clip in a weapon can be removed and used to power the jet pack and vice versa, E-clips are common and readily available throughout North America, they are small, lightweight, portable and can be recharged.